Instead of pondering how many days until summer, consider cleaning up your mess -- starting with organizing all that winter gear. To keep your hats, gloves, scarves and snow boots in order, here are the best ways to stop the blizzard of clutter. Seems like this winter just won't give up for millions of Americans. Instinct tells us to stay indoors at home and avoid the record low wind chill at all cost. But if your home is cluttered and disorganized, it's probably the last place you want to be. In season, it's important to store winter accessories where they can be easily put away and pulled out quickly. For most people, that is in a coat closet, mudroom or entryway area. Whatever the layout of your home, there are a variety solutions that will keep things in order. This solution tends to work best when organizing winter accessories for a family. Set-up and label bins for each family member to avoid mix up. The bins can be stored on closet shelves, under a bench or on shelves in an entryway or mudroom. If you already have built-ins in a closet, set aside cubbies for each family member. Or you can use separate cubbies for hats, gloves and scarves. Don't forget the labels! Drawers are also a good solution in an entryway closet. You can have them built-in or consider freestanding elfa or basic plastic drawers if you are a renter. Designate a drawer for each family member or separate different types of accessories into each drawer. It's not just for shoes anymore! Use the pockets in this organizer to store gloves, hats and even scarves. If you have extra space, consider using the pockets for umbrellas and even grocery tote bags. Use it to store anything you need when heading out of the house. Use what you have! You can keep it simple and store gloves in coat pockets and earmuffs and scarves on jacket hangers. There's nothing worse for your floors than snowy and salty boots. Consider these two options to keep it neat. Sometimes the best place to let your winter boots dry out is on the floor of your mudroom or coat closet. However, use a tray to capture the mess. 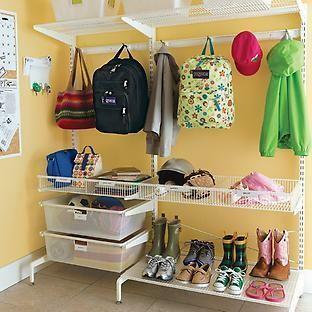 If you have the space, a rack mounted on a wall in your mudroom or even on the back of a closet door is the way to go. Permission granted from author to use all photos.